The movement that took flight in November is racking up wins—and laying the groundwork for more victories to come. First, for decades, they ignore you. Then, when things get serious, they laugh at you for being too demanding. Then, you win, and you keep winning. 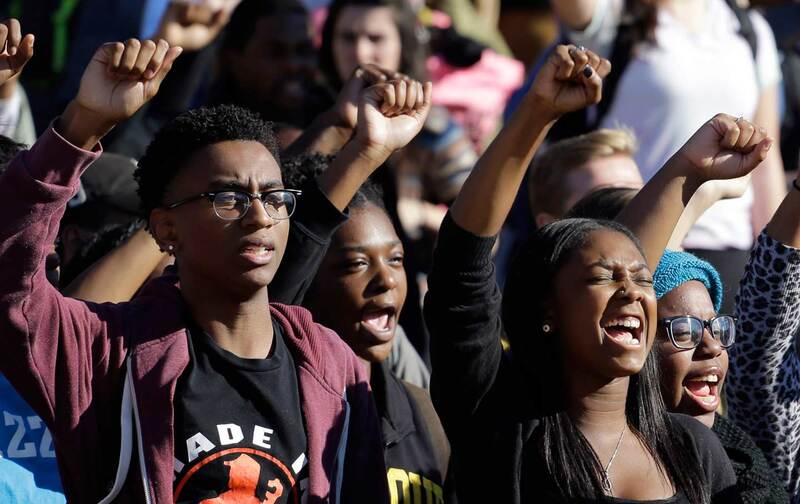 And the black student movement, from the University of Missouri to Yale, rolls on. In this post, students from four universities outline what happened in the fall and offer hints of what’s to come. This post is the new incarnation of The Nation’s youth organizing feature and is edited by James Cersonsky (@cersonsky). In the decades following the desegregation of the University of Alabama, we were told to be grateful for our presence on campus. And yet, we existed in an environment in which our professors and administrators didn’t look like us, our classes were held in buildings that glorified KKK members and Confederate generals, and institutional barriers—to campus organizations, scholarships, and alumni networks—limited opportunities for black students. As black students, we did not have a place to gather to discuss our experiences with racism on campus. We effectively did not have an office of diversity, nor did we have a safe and efficient way to report sexual assaults and hate crimes. Black and Muslim students were forced to accept being followed at night and being harassed by racial slurs, while the students who preyed on them were rarely held accountable. It was a campus that was not yet equipped to meet the evolving needs of its student body. In October 2015, I produced and co-wrote the short video “How Does It Feel to be a Problem?” with the hope of educating my peers and others around the country about the intersectional nature of black experiences and the uncomfortable vulnerability of black bodies on college campuses. In September and October, spurred by the boldness of students at the University of Missouri, we launched the “We Are Done” movement. We drafted 11 demands, taking into consideration the opinions and needs of students of all ethnicities, sexualities, genders, socioeconomic statuses, and abilities. We aimed to combat sexual assault and bigotry on campus, while advocating for the creation of an office of diversity and an increase in funding for departments and organizations that were committed to intersectional activist work, such as the Department of Gender and Race Studies and the Women’s and Gender Resource Center. On November 19, 300 students gathered in Malone-Hood Plaza, the location of George Wallace’s infamous 1963 “stand in the schoolhouse door” in opposition to the enrollment of African-American students Vivian Malone and James Hood. After the demonstration, we met with administrators to debate our demands. Less than three months later, on February 1, we were able to hold the grand opening ceremony for the new Intercultural Diversity Center. And, in response to our push for the inclusion of diverse voices in the strategic planning committee—one of the committee’s responsibilities is to guide the creation of the office of diversity—we’ve seen the creation of a diversity subcommittee to obtain feedback across campus that will be incorporated into the university’s five-year Strategic Plan. This semester, we will continue to work with feminist groups, African-American groups, religious groups, LGBTQ groups, and other organizations representing marginalized peoples to develop policies that are both inclusive and respectful of the unique experiences of each group. We intend to use the university’s new Intercultural Diversity Center as a place to hold forums and other programming on diversity and oppression. In our effort to organize against structural inequality, we will continue supporting each other across lines of difference—rebutting the claims of our detractors that organizing against racism is too “divisive.” We recognize that the path to equality is dependent upon an intersectional approach to our rhetoric and strategy. Last November 18, at 3:30 pm, concerned black students walked into the office of Towson University’s interim President Timothy Chandler’s office, chanting, “We want answers now!” and “Black students matter!” We issued a list of demands, from increasing the number of black professors on the tenure track to terminating the university’s contract with Maryland State Correctional Services. It was our intention to remain in that office, chanting for as long as we had to, until there was an institutional agreement to commit to the mental, emotional, and intellectual health and development of the black students of Towson. After nine hours of revising the demands, we walked out of the president’s office with a signed document. Our protest has also given rise to the Organized Network of Student Resistance, a group dedicated to pushing conversations of intersectionality and engaging in direct action to dismantle institutional racism. We hope to connect with students across Maryland, and beyond. Our success has led to death threats and racist comments via Yik Yak from fellow Towson University students. Others slandered our tactics. One op-ed claimed that our president deserved to be fired for signing our demands. Amid the blowback, we were asked, Where did all this come from? The #OccupyTowson protest did not spring up from an isolated incident. On November 11, black students shared their personal narratives at a campus-wide event on racism at our university. These stories included eggshells thrown at black students along with racial slurs; sexual and racial epithets from classroom professors; the lack of representation among black faculty on the tenure track; and a deficit in cultural understanding among our peers. None of this is new. Towson University has a history of institutional, overt, and micro-aggressive racism. Only two years ago, a noted white supremacist, Matthew Heimbach, led night patrols armed with batons under the guise of protecting white communities from black men at Towson University. That same year, Jared Taylor, a white nationalist and founder of New Century Foundation—an organization dedicated to better “understand the consequences of America’s increasing diversity”—was invited to speak at Towson on behalf of Heimbach’s student government-funded White Student Union. Additionally, Towson’s diversity councils are predominantly white, with, for example, only two people of color on the president’s 9-member council. To achieve freedom, we have to abolish white supremacist institutions that oppress us. In December, the Afrikan Black Coalition successfully pressured the University of California system to divest $25 million from the three largest private prison corporations, CCA, the Geo Group, and G4S. The UC is now the first educational system in the United States to divest from private prisons. ABC is now targeting Wells Fargo to end its $900 million credit line to private prisons; if it does not, ABC will push the UC system to divest its $425 million investment in Wells Fargo. This victory was made possible after extensive research into the UC’s investments revealed major private prison investment. In turn, ABC filed a Freedom of Information Act, met with the CIO of the UC system, and published an expose on these morally bankrupt investments. Framing it as a moral disaster, we relied on public pressure and the threat of direct action to win divestment. In addition to divestment, the Black Student Unions that are a part of our coalition have issued demands for racial justice to administrators at UC Berkeley, Merced, Davis, Santa Cruz, and Cal State, LA, and have already achieved some institutional wins, including the creation of a $20 million dollar scholarship for black students and the hiring of black psychologists. ABC has also supported AB 253, a new law that requires stop data to be recorded by police departments across California. Later this month, we are finalizing the induction of seven California State University campuses into our coalition. At a time of pronounced white supremacist violence, we must unify. Planning for the “Take Down the Flag” campaign at the University of Mississippi began after the shooting of nine African-Americans in Emanuel AME Church in Charleston, South Carolina. Following the tragedy, there was a nationwide call for institutions to reconsider their use of Confederate iconography and memorabilia. The University of Mississippi’s racist history, in conjunction with exclusionary symbols like those of Confederate battle flags, fosters a space that is unwelcoming to students of color. Our campaign for the removal of the current Mississippi state flag, with its Confederate battle flag insignia, began as the first phase in a longer campaign for the removal of all symbols of white supremacy on campus. In September 2015, we formed a small coalition, Students Against Social Injustice, and dropped letters in the administrative building addressed to the interim chancellor, the vice chancellor of student affairs, and the dean of students. These letters outlined a number of demands for the university, including more campus spaces for people of color, a ban on the Confederate battle flag at campus events, and the removal of the Mississippi state flag from the center of campus. While awaiting a response, we continued our outreach, gaining the support of a number of student organizations and dozens of faculty, staff, and departments. Three weeks later, we met with administrators, leaving frustrated but better equipped to fight on. Following the meeting, we held a public forum titled, “Confederate Symbols: A Conversation on Southern Heritage,” to educate the campus community about the history of the evolution of the flag, its meaning, and its long-running ties to the university. After the forum, representatives from the Associated Student Body reached out to bring the issue before the student government. In addition to writing and lobbying for Resolution 15-3, a resolution to remove the state flag from campus grounds, we held a rally on October 16 that attracted a crowd of more than 300. At the rally, black students spoke about their experiences with racism and exclusion. Following the rally, the Ku Klux Klan and League of the South arrived on campus to conduct a counter-protest. Slurs were hurled at black students, and the ensuing altercation began to disrupt classes, so the counter-protestors were escorted off campus. Thereafter, the university came under new, nationwide scrutiny—and faculty and students wrote op-eds and statements of support, and online posts under #TakeItDownASB. Finally, on October 20, the ASB Senate met to vote on Resolution 15-3, which passed by a vote of 33-15 after a three-hour deliberation. The following day, the Staff Council, Faculty Senate, and Graduate Council all passed resolutions of their own supporting Resolution 15-3. At dawn on October 26, university police removed the flag from the circle. The removal of the flag only scratches the surface of exclusionary practices at the University of Mississippi—as well as nostalgic reminders of racism, which include a large Confederate monument and buildings named for prominent white supremacists. We have compiled a more detailed list of demands for the university administration that we will be releasing this spring.